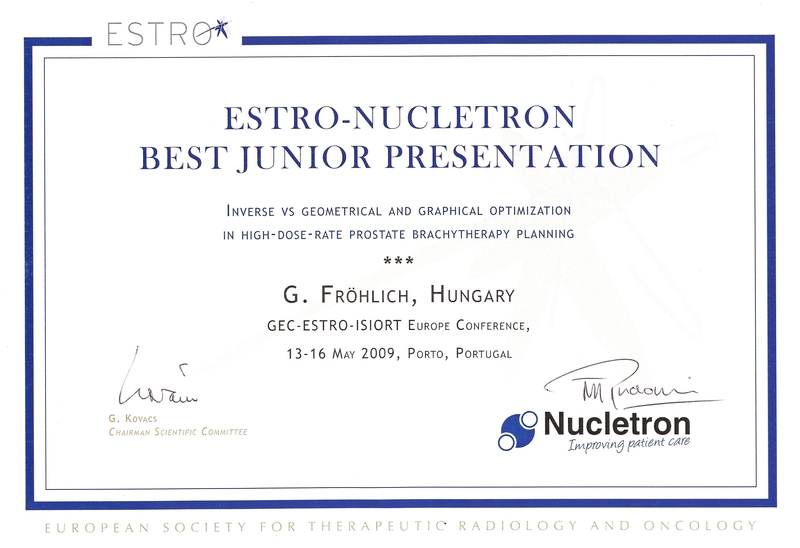 Results of HIPO evaluation were presented by two independent institutions at GEC/ESTRO/ISORT Europe Conference, held at Porto, Portugal, May 13-16, 2009. The abstracts are published in Radiotherapy & Oncology vol. 91 (1), 2009. Another study was presented in ABS Annual Meeting, held at Toronto, Ont., Canada May 31 - June 2, 2009. "Inverse vs. geometrical and graphical optimization in high-dose rate prostate brachytherapy planning"
Radiotherapy & Oncology, p. S43, 91 (1), 2009. Radiotherapy & Oncology, p. S42, 91 (1), 2009. "An investigation of effective optimization algorithm for ultrasound based real time HDR brachytherapy for the prostate"
University of Texas Health Science Center at San Antonio, Texas Cancer Clinic, San Antonio, TX.